Walker Stapleton’s enthusiasm gap can be summed up in one photo. When he visited Sterling, Colorado, on Monday, he drew in a whopping two people—an elected Republican official and a Republican candidate—to hear his ideas for Colorado. Despite not doing his job and missing from work for weeks at a time while campaigning with fringe right-wing figures like Tom Tancredo, Stapleton isn’t getting his voters all that excited. Likely because his real base consists of his special interest donors. For the record, that’s Jane Bauder, a candidate for Logan County commish and Josh Sonnenberg, chair of the local Republican Party. As for why nobody else showed, reports the J-A? 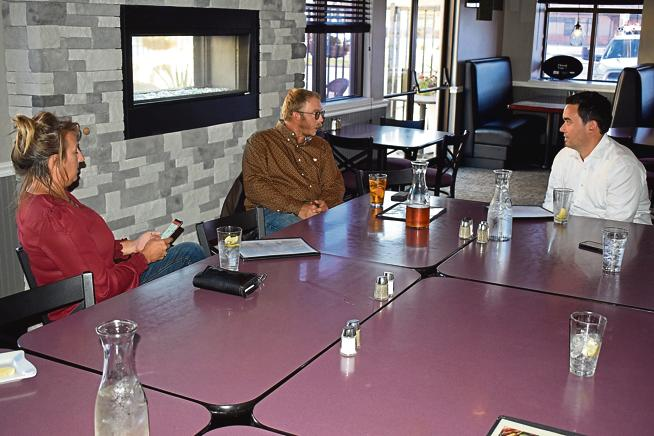 A planned northeast Colorado business roundtable at The Grill @ River City was short on attendees; according to Josh Sonnenberg, president of the Logan County Republican Party, several businesses in Sterling were affected by loss of Internet service Monday and that likely prevented business people from being able to break away. We’ve been to Sterling, and “the internet was down” doesn’t seem like a very good excuse for why nobody showed up to Stapleton’s campaign event there. Logan County is about is safely Republican as it gets, and sugar beet harvest season isn’t until October. So in the absence of a better explanation, we’re forced to agree that Stapleton just isn’t a draw. And, well, yes, Tom Tancredo probably would be. That's secession country. Definitely needs Tancredo out there. You mean the good ol' 51st State? Sounds like the Republican Party candidates this year are suffering from an extreme case of nocoattailitis. Staplegun sneezed on Broccoli who gave it to shorter Coffman, on down the line! After the roundtable, Stapleton also visited the county Republican headquarters for a meet and greet event. 1. The picture of three people at a square table with several empty seats and other untouched glasses of water is a challenging one. In context, I thought the headline was "Stapleton slumps in Sterling." 2. The journalist/photographer didn't go along to the county headquarters to see what would happen there. Stapleton hopes he can break the Republicans' losing streak in the governor's race. But political observers from both parties suggest the odds favor Polis. If he can't do any better than that in Sterling, he's toast….Unless of course the Russians hack him a win like they did with Trump. Look at Jane tapping away on her phone while sitting right there in front of him. I've been at some low attendance public meetings, but at least the people were engaged and took advantage of the attentive audience.